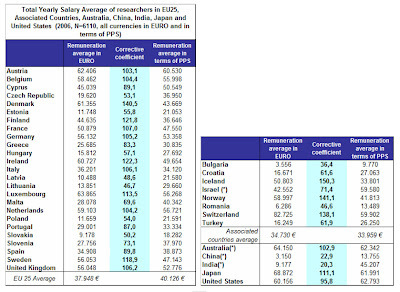 The Figure above presents the average researchers’ remunerations in EU25 and Associated Countries. The averages are also presented in terms of standardized PPS, that considers the cost of living in each country, while allowing multilateral comparison at international level (including Australia, China, India, Japan and the United States). The corrective coefficients in those countries are the PPP (Purchasing Power Parities) from 2003 published by the World Bank. The accuracy of the data (consistency and reliability of the study results) are either excellent or high in 20 out of the 33 countries analyzed in this study, representing 87,15% of the total number of researchers in Europe. High differences between the remuneration of researchers throughout the EU25 and Associated Countries, although the gap between the levels of remuneration in each country reduces when considering the cost-of-living. Only Austria, The Netherlands, Israel, Switzerland and Luxembourg have an average remuneration similar to that of the United States, considering the cost of living in each country. High differences in expected career progression throughout the EU25 and Associated Countries. In most of the countries, the remuneration for men is higher than for women. In Greece, the average researcher's salary is 25.685 Euro much below the EU25 average of 37.948 Euro. If we normalize in terms of standardized PPS, that considers the cost of living in each country, the numbers are 30.835 Euro and 40.126 Euro respectively.